With huge chains and honking cranes, that's how. Example: This Republic of Korea Navy's corvette—half of it, actually—floating over the sea's surface. And before you cry "PHOTOSHOP! ", check out the scene from a distance. Click to viewIt's the Cheonan, a South Korean Pohang-class corvette that broke in two on March 26. According to an international investigation, the cause was a torpedo fired from a North Korean Yeono class miniature submarine, killing 46 crew members. 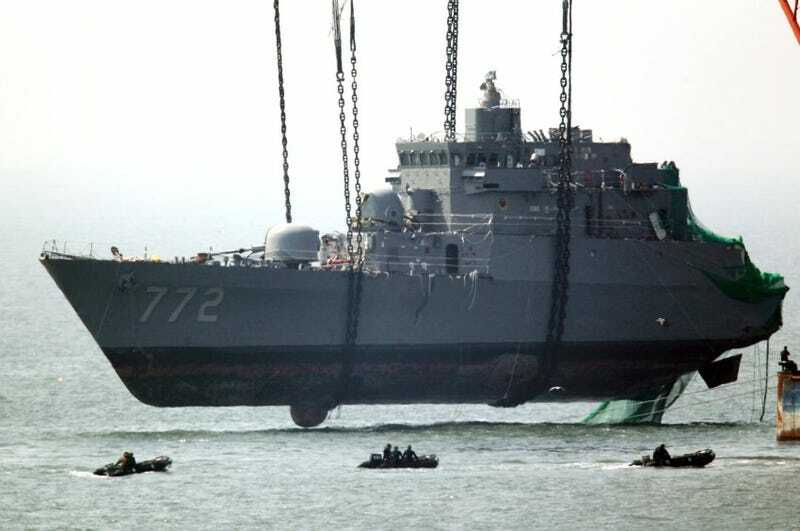 A few weeks later, on April 15, the South Korean Navy recovered the stern part from the bottom of the sea using a giant floating crane. On April 24, the bow was recovered.